Hurricane Irma, now downgraded to a tropical depression, wrecked havoc across the Caribbean this weekend and killed at least 42 people, but museums in Florida were mostly spared from any large-scale destruction, according to early reports. Following evacuations ordered last week, residents are slowly returning to their homes and some institutions plan to reopen this week. The Perez Art Museum Miami (PAMM), which sits on Biscayne Bay, “sustained no damage to the building, and suffered no flooding,” a spokeswoman said. “The roof held well, and there was no problem with the hurricane-resistant windows. Surge from Biscayne Bay did not reach the building, even at high tide.” And all the works in the collection, including sculptures installed in the garden, are in fine condition. “PAMM expects to have the building fully ready for opening and welcoming the public on Thursday, 14 September, at 10 am… and is planning family-oriented programming,” the spokeswoman added. Due to a curfew, that was not lifted until Tuesday afternoon, some other museums were still waiting to assess any damage, including the Bass Museum and ICA Miami, both of which are under construction ahead of reopenings planned for the coming months. However, a public lecture with the artist Mark Handforth at the ICA’s temporary space in the Design District, schedule for Friday 15 September, has been postponed. “We are thankful that our staff is safe and accounted for and our thoughts are with those who are still battling the aftermath of the storm,” said the Bass’s executive director Silvia Karman Cubiñá. According to a news update issued by FIU, which turned over its recreation centre as a shelter for locals and opened its Green Library to students and faculty on Tuesday, surveys still need to be done of the The Wolfsonian and the The Jewish Museum of Florida, which it operates. 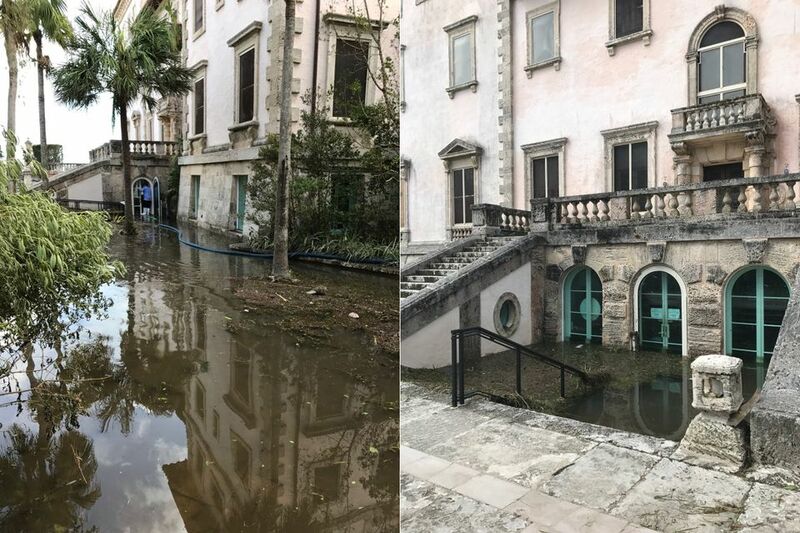 One historic site, the Vizcaya Museum and Gardens in Coconut Grove, did sustain some serious flooding to its basement, café and stores, although the main building and its collections remained safe. A truck arrived on Tuesday to begin pumping out the water from the lower levels. “The good news is there are no art collections stored [there],” a spokesman told the Miami Herald.